A tool belt is something every worker should own. It works like an extended hand and helps you carry your important tools everywhere with great ease. It can be hard for you to concentrate on work as well as look after your tools and waste time searching for them. You also cannot carry your tools and work at the same time, so this is where a tool belt comes handy. Good quality tool belts do cost quite a bit, but they are worth investing your money in. Choosing a good tool belt can be hard as there is a large variety of them available at the market. But don’t worry because we are here with a perfect tool belt guide for you. 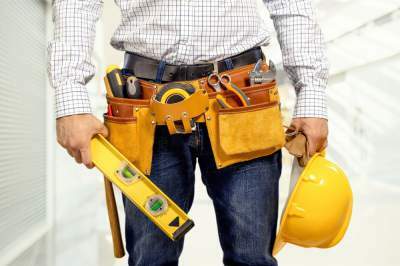 Also, many workers are still confused as to how to properly wear a tool belt, so we are going to explain all of that in detail in this article. How to wear and use a tool belt properly? No matter what kind of work you do or what kind of tools you use, it’s important to pick up a tool belt that has enough space to fit in all your essential tools. Try out every option available to you and see if it matches all your requirements. Most tool belts have enough space to fit in basic tools like pliers, screwdrivers, small hammers, measuring tapes, etc., but if you need to fit more tools then choose your tool belt accordingly. There are two reasons why some workers fail to wear a tool belt properly and use it; it’s either because they genuinely don’t know how to wear and use it or because they haven’t got the right fit for them. We are going to address both the problems here. Right fit is everything when it comes to a tool belt. You need to find a tool buy that makes you feel comfortable while wearing it; it should neither hang too high nor too low. That’s why it’s very important to test it with all the tools you need for your work. If it weighs you down to an extreme extent, then maybe it is not the right one for you. Check the tool belt properly and see if all of its pockets are strong and wide enough to hold your tools. The material used can also determine the quality of it up to a great extent. The leather is obviously considered the most durable one, but if you are a DIYer, you can go for nylon or canvas as they cost less and are also light-weight. Leather ones are perfect for professional use as they are very durable. Pay more attention to the belt and its buckle mechanism; simple ones are the best as they are easy to wear and remove. If you find any fault in the mechanism, don’t purchase it. Don’t act like a cheapskate when investing in a tool belt because you get what you pay for. A lot of times you can get good quality products for little money, but that’s not always the case. As mentioned above, it's essential to select a good belt if you want to benefit from it. You should check for multiple-pockets because that's why someone would go for a tool belt, right? If you had only a handful of tools, you wouldn't be looking for a tool belt. Also, make sure that the pockets are located where your hands can reach easily. All the main and important tools for your work should be put in a place where your dominating hand can reach easily. Main tools usually include framing hammer, pliers, carpentry pencils, liners, etc. Some people also like to put a small or knife. All the tools that you rarely use can be placed near your helper's hand. Place them at an accessible place, but main priority should be given to your main tools. Twisting the tool belt can allow you to move comfortably. If you need to bend or do some work which requires many movements, then you should loosen up the belt a bit and twist it towards the other side so that it doesn't weigh you down and allow you to be flexible. If you have been working for a long time with your belt on, reversing its direction can help you relax for some time. It’s best to keep only essential the tools in your belt/pouch while climbing the ladder as filling the pockets with heavy tools will not ensure safe and comfortable climbing. Also, make sure you’re not climbing the ladder with tools in your hand. Both of your hands should be free while climbing a ladder. Go for a tool bag with a padded belt to avoid any bruising and don't go for harness style suspenders. Also, good suspenders can help in readjusting the whole weight of your tools. If you find any tears on your tool belt, just take out all your tools from it and place it in a cool and dry location. It's essential to look after your belt and protect it from all the damage. Regular cleaning should be done for tool belts. If you have a leather belt, you should use a special conditioner and dressing to prevent any dryness and cracks. As for other belts, they can be cleaned with plain water but make sure to not expose them to extreme heat like placing them on hot appliances. Don’t place them under direct sunlight for long because this wild either dry them out or a mild-dew will form in the presence of some moisture. 1. Get rid of dust or dirt from your belts regularly, especially leather. You can do so by using a soft-bristled brush or just a shoe cleaning brush. 2. There are special creams and conditions available in the market to keep leather belts as good as new. Make use of them once in a while to keep your leather belt keep looking new. 3. Keep your belt away from extreme heat and direct sunlight for a long time. Store it in a cool and dry place. 4. Wipe stains and dirt right away after you see them before much damage is done. A piece of cloth will suffice if you wipe it away immediately. 5. Check your belt regularly for any kind of damage. 6. Also check buckles, loops, and zips (if any) on it. If you work under damp conditions, then you should check out full-waterproof tool belts. Even if you get a waterproof one, keep it away from chemicals. Make sure to fasten the belt properly and don’t flood the pockets with tools. Also, don’t try to fit big tools forcefully into the pouch as it can result in tearing of the material. No matter what kind of liquid, it should never be put directly into the pouch and its pockets. Another thing to keep in mind is that one should always put the tools inside the pouch in an upside down position. This will ensure that the sharp side of the tool doesn’t come in contact with the material and tears it down. So that’s about it. Following this guide will help you make use of your tool belt efficiently and for a long period of time. Tool bags or pouches are a really great invention as they allow you to complete your task in less amount of time without compromising with the quality. Searching for tools can take a lot of time, but tool belts help you organize all your tools and also keep them assembled at one place near you. You don’t need to take the focus off your work to look for a tool. Use your dominant hand to reach out for essential tools such as a hammer, knife, pencil, etc., and your other hand, i.e. helper hand to reach out additional tools such as measuring tapes, fasteners, etc. Before the invention of tool bags, workers and DIYers used to spend a lot of time in bringing all the tools from one place to another. Also, they would stuff the pockets in their shirts and pants with tools. Thankfully, we have tool belts now, and we can save a lot of time and use it wisely on better things and projects. We hope we were able to clear all your doubts regarding tool belts and how to wear them properly.